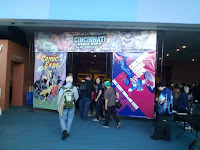 I went to the second annual Cincinnati Comic Expo earlier today. I recall hearing about it last year, but I'm pretty sure I had something else going on that I couldn't attend the debut. But for being only the second year of a show without the backing from the likes of Wizard or ReedPop, I have to say I was pretty impressed. I got there about a half hour after it opened, and it was already pretty busy. Not wall-to-wall crazy busy, but plenty of people to be sure. I did a quick walk-through of the place to get a sense of the layout. All of the aisles were pretty comfortably wide and allowed for a good amount of traffic. It wasn't huge (there were 114 booths/tables set up among retailers, creators and others) but what they had seemed like a good mix. Some solid retailers and a fair balance of creators from small press folks to name Marvel/DC creators. I attended the 11:00 panel called "Dawn of the Digital Era" moderated by Michael Uslan. I don't want to get into much of here (I'm going to make it the subject of my next Kleefeld on Webcomics column for MTV Geek) but I was pleasantly surprised at the mix of panelists they had. Afterwards I headed over to get some books signed by Jim Steranko. It looked liked he had a steady line of 15-20 people the whole time he was available, so it wasn't too bad of a wait. It was the first time I'd met him, and I was struck by a few things. One, he still looks great, especially for 72 years old. Hell, I know 50 year olds who don't look that good. You don't see many current pictures of him, so it's good to see that he's not shying away from the camera because he looks bad or unhealthy or anything. Two, he was really personable. I'd never really heard anything one way or another about his demeanor with fans, so I was pleasantly surprised that he was warm and cordial with everybody I saw. I mean, this is a guy who's proven himself as supremely talented in several fields, so it would be easy to assume that he's got a huge ego or something. But he was answering questions, and shaking hands, and making sure he spelled everyone's name right. He did seem mildly impressed that I had first edition copies of his History of Comics books to sign, and I think I caught him off-guard a bit with my question about his days as an illusionist. Most everyone else in line seemed to focus on his Captain America and Nick Fury stories, and had recent reprints for him to sign. Like I said, though, he was warm with everybody; the two people in front of me only had con programs and seemed to have only a vague understanding of who he was and what he's done over the years, but he was still smiling and happy to sign their stuff. I scanned through the retailers at that point. Which was kind of a mistake because I stumbled across a nearly complete, continuous run of Tom Strong for cheap. The money wasn't so much an issue as that all the issues were individually bagged and boarded, so my bag got a bit unwieldy at that point. But shortly after, I ran into the manager of one of my old comic shops and we chatted for a little while. He was quite concerned about what was going to happen in January/February when all the folks who bought the 52 #1s from DC drop everything. He said he's already had several people who originally requested all of the issues of all the titles be added to their pull list, only to eliminate every one of those books within the past week or two, once they started reading these revamps. He also pointed out the folly of having all the titles not only start off with large story arcs, but also that the arcs will likely flow on the same schedule. Meaning the slower parts in the middle, which typically sell a bit worse than the beginnings and endings, are all going to hit at the same time. Meaning all of the titles will make a deep sales nose dive on their third issues. In January/February. Yeah, he wasn't looking forward to that. I spent my last hour there attending the Captain American Retrospective panel, again moderated by Uslan. Though he made sure that Mitch and Elizabeth Breitweiser weren't left out, Uslan not surprisingly had a lot of questions for Allen Bellman. Bellman has only recently been re-discovered by comic fans, and he's still humbled and thrilled that so many people regard his work as noteworthy. He had some good stories, both new and old, and he got a standing ovation from the room at the end of the panel. I considered heading back into the main portion of the con one last time to pick up a copy of Uslan's new book, The Book Who Loved Batman, but I checked my wallet first and realized that I wouldn't have enough to get out of the parking garage if I spent more than a couple of bucks. This was, I believe, the first time I've been in downtown Cincinnati since I used to work there (just a block away, in fact, from the convention center) a decade ago. One thing I did like about that specific part of town was that it was RIGHT off the freeway, so you don't have to fight a lot of congested traffic. In fact, even with the city's annual Oktoberfest happening just up the street and with roads closed to accommodate that, I had zero difficulty getting in and only a tad more difficulty getting out. And that Oktoberfest was happening this same weekend, and the show still seemed pretty well attended speaks to something they're doing right. I think it's a good mix of mainstream and indie folks, and with its focus on comics almost exclusively, it's a show I'm going to keep on my radar to try to attend in the future. I really enjoy the Cincinnati show. I think they do a great job, and it keeps getting better. I look forward to your MTV Geek column, too. I just hope I didn't sound like a dolt. Seriously, though, it was a good panel and some good perspectives from everybody. I don't think anyone came across as dolt-ish at all.